Monday, 13 August 2018, 12:50p.m. 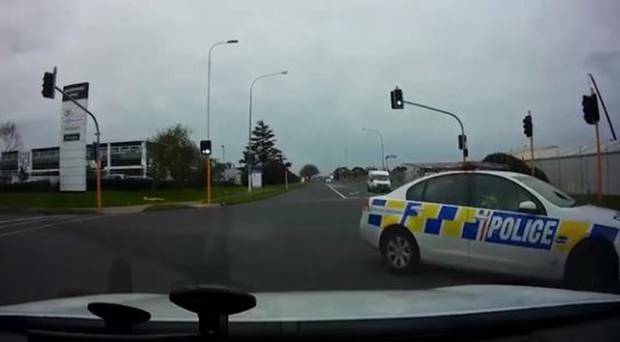 An Auckland police officer's dangerous driving at a set of red lights has been caught on camera. Dashcam footage captured the moment a police vehicle nearly collides with an oncoming car after the officer appeared to run a red light. The driver of the car with the dashcam was heading through a green light when an officer turning right ran a red light and cut off oncoming traffic - coming inches away from crashing into the car. The car with the dash cam has a green light, allowiing them to continue driving straight on Kerrs Road. Photo / Shocking Auckland Drivers. The police car did not have its siren or flashing lights activated during the dangerous manoeuvre. 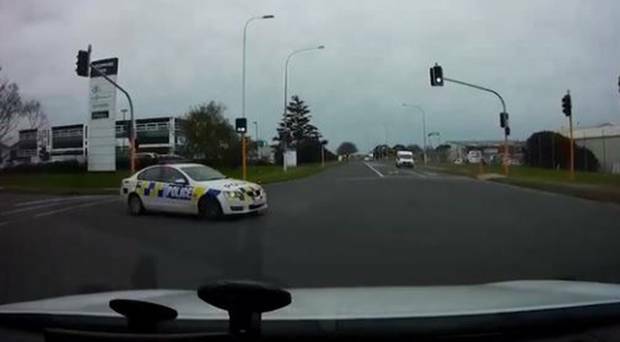 The incident, which was filmed at 2.23pm on August 8, occurred on the corner of Kerrs Road and Dalgety Drive in Wiri, South Auckland. 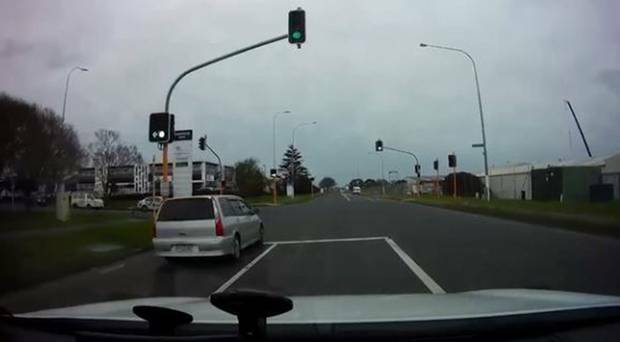 The video was posted to Shocking Auckland Drivers Facebook page with the caption: "Above the law?" Auckland road users took to social media to complain about the officer's behaviour. "If you watch closely the lights change to green just before the cop comes out - which means if he was watching he would have seen it change to red. So he saw the light, saw the cars moving and went anyway, he didn't have lights or a siren on so it wasn't police business. Above the law or just not concentrating about the job?" one person wrote. Another said: "What a douchebag. Hope you managed to get a rego number but then again nothing ever happens to a man of the law for breaking the law." Others joked saying the officer was racing to get "Dunkin Doughnuts just around the corner". Police have been contacted for comment.